Tilton Gallery is proud to present an exhibition of sculpture by John Outterbridge, his third solo show with the gallery. The exhibition will open Tuesday, November 13th, 6 – 8 pm and continue till January 19th. John Outterbridge has been an outspoken and poetic voice in the Los Angeles art community since the late 1960s. A community organizer and educator, Outterbridge was co-founder and Artistic Director of the Communicative Arts Academy in Compton, CA from 1969-1975 and director of the Watts Towers Arts Center in South Central Los Angeles from 1975-1992, taking up the mantle from Noah Purifoy, and bringing the arts and art education into the African American community. Born in 1933 in Greenville, North Carolina, Outterbridge moved to Los Angeles from Chicago in 1963, having already begun making assemblages. In Los Angeles, he soon became a central figure in the art community that included Noah Purifoy, David Hammons, Betye Saar and many others. Outterbridge’s work reflects both his roots in the segregated South of the 1940s and 1950s and his involvement in the Los Angeles Black Arts Movement during the civil rights era. Growing up, the repurposing of discarded materials and objects was a given in his house and in his community. His father moved “junk” for a living and the backyard was filled with old objects, waiting to be fixed and reused. In Los Angeles, Simon Rodia’s Watts Towers represented a powerful example of how fragmented, found materials could be repurposed into an object of beauty. Our current exhibition includes work from circa 1970 through the 1990s, focusing primarily on the artist’s more figurative works, with the addition of two more abstract, symbolic works from 2006 TILTON G A L L E R Y and 2011. Outterbridge’s work over the years evolves from abstraction to figuration and back, but always has meaning. Whether directly, or through symbolism and poetic metaphor, the artist always has something to say and each work speaks to the state of the human condition and is often a political comment on the specific condition of African Americans in this country. Throughout his career, Outterbridge has worked in overlapping and at times intertwining series. His early Containment Series, although visually abstract, made out of hammered and assembled sheets of metal, often with wood and leather, speaks to the constraints of slavery and continuing contemporary containment of black Americans from freedom. This was closely followed by the Rag Man Series, works made of sewn and painted canvas, stuffed with fabric to create literal and abstract three-dimensional “bags.” One of the most quintessential pieces from this series, Plus-Tax: Shopping Bag Society, Rag Man Series, 1971, exhibited here, is an overflowing shopping bag, actual paper tags hanging out over the edge, and addresses the state of consumer society. Outterbridge’s Ethnic Heritage Series, roughly 1978-82, is more directly figurative. Complex and personalized figures that reference African sculpture and ethnic effigies, Outterbridge’s “dolls” (as he calls them) of this period extend the early “Rag Man” stuffed canvas shapes, turning them into representations of human figures clothed in colorful scraps of fabric, at times bearing beaded necklaces and hair, anklets and other charms. They vary from Tribal Piece, Ethnic Heritage Series, a majestic female figure (whose male counterpart is currently on exhibition in Soul of a Nation at the Brooklyn Museum), standing with attitude and a painted peace symbol on the back of her head, to Untitled, Ethnic Heritage Series, an ornamented, effigy-like upright female, to The Elder, Ethnic Heritage Series, a balding figure with arms and face uplifted, clearly a being of wisdom, to be venerated. And, again more abstract, the torso and legs of a figure thrown across a wooden cart, entitled Captive Image, Ethnic heritage Series (one of a larger sub-series with this title). 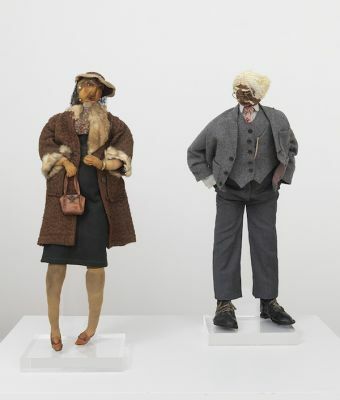 These Ethnic Heritage figures were preceded in the early ‘70s by even more realistic “dolls, “ Sister Mamie and her untitled companion in a gray suit, as well as an untitled self-portrait of a man with scarf and swag. These wear clothes and shoes and jewelry and handbags, wholly made and sewn by the artist. Outterbridge has stated that these manifold Ethnic Heritage figures represent an effort to record and portray the individual and personal histories of human beings to regain their heritage. In the 1990s, Outterbridge returned to working with metal and wood, all the while continuing his use of discarded bits of fabric, including that of torn American flags, important in his works from all periods, from in his dolls to Window with Footnote, 1991 and In Search of the Missing Mule, 1993, as well as later abstract works. Asafedita bags (sewn handmade balls filled with healing herbs) are also an ongoing element, as in Sacred Hymns and Broken Tongues, 1996 and Healing, 2011. The mule, often missing, but included in the titles of a number of works, literally appears, along with more scraps of torn or discarded materials, in an otherwise abstract Untitled wall sculpture of 2006. The long twig in this work, wrapped in these rags, represents family lineage to the artist, referring again to history, both personal and of the human race. A final recurring theme is Outterbridge’s incorporation of the American flag in his work, always partial, but recognizable, as in the very early 1969 Traditional Hang-Up, Containment Series (currently on exhibit in Soul of a Nation) or in the undated Untitled (Snake) and, again, in In Search of the Missing Mule, 1993. These last two works are pivotal to a reading of Outterbridge’s work. Untitled (Snake) is an almost 6 foot curving wooden snake hung angled, climbing up the wall, and painted in red, white and blue, the stars and stripes of the flag chopped up and reassembled. At once lively and humorous, with bulging eyeballs, and ironic and politically meaningful, this work questions the state of the Union. In Search of the Missing Mule, 1993 is arguably Outterbridge’s most iconic and important large sculpture. An abstracted majestic steel figure stands tall (over 7 feet) with wooden arms outstretched, contained within a circular barrel-like curved metal structure. A headband of fabric remnants adorns his head, blindfolding him and simultaneously personalizing the figure, giving him character with his courage and strength. More fabric (“rag”) remnants hang from one shoulder along with strips of a torn American flag. A thick rope knotted as a noose also hangs from this shoulder and an unused leather yoke for a mule rests on it. With this powerful figure, Outterbridge continues the search for the freedom symbolized by the missing mule and forty acres promised upon emancipation and reasserts his claim for all African Americans. Outterbridge has exhibited widely since the late sixties. His work was included in the Pompidou Center’s ground-breaking 2006 exhibition, Los Angeles, 1955-1985: The Birth of an Artistic Capital and in New York at Tilton Gallery in L.A. Object & David Hammons Body Prints, also 2006. His work was represented in six of the Pacific Standard Times 2011-12 exhibitions in Los Angeles, including in Now Dig This! Art and Black Los Angeles 1960-1980. It is currently included in the traveling exhibition organized by the Tate Modern, Soul of a Nation: Art in the Age of Black Power, Outliers and American Vanguard Art that originated at the National Gallery, Washington, D.C. and West by Midwest: Geographies of Art and Kinship at the Museum of Contemporary Art, Chicago. His work is in the collections of The Museum of Modern Art, New York and the Los Angeles County Museum of Art, among others. Accompanying John Outterbridge is a small group show, East Coast/West Coast: Part II, of artists surrounding him in Los Angeles, also making distinct West coast assemblage: Noah Purifoy, Betye Saar and Timothy Washington; each address the Black experience with different degrees of abstraction and figuration within this mode. East coast painter Ed Clark, a New York Abstract Expressionist, addresses the condition in entirely abstract terms. David Hammons bridges the two coasts, here represented by an early body print made in LA where he knew Outterbridge and where he began his highly conceptual and poetic installations and sculptural works that he has continued since his move to New York in 1975.